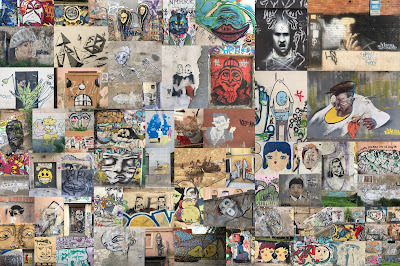 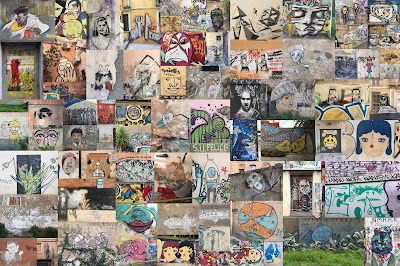 Two variations of a mosaic collage of 76 street art photos taken in Cagliari, Sardinia. Street art along Via S. Saturnino, Cagliari. 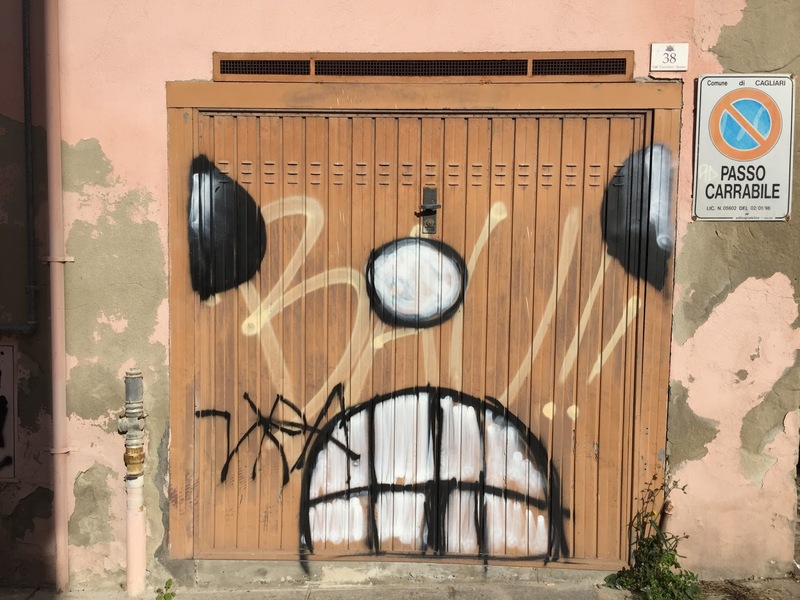 We recently spent a week based in Cagliari, the regional capital of the island of Sardinia, an autonomous region of Italy. 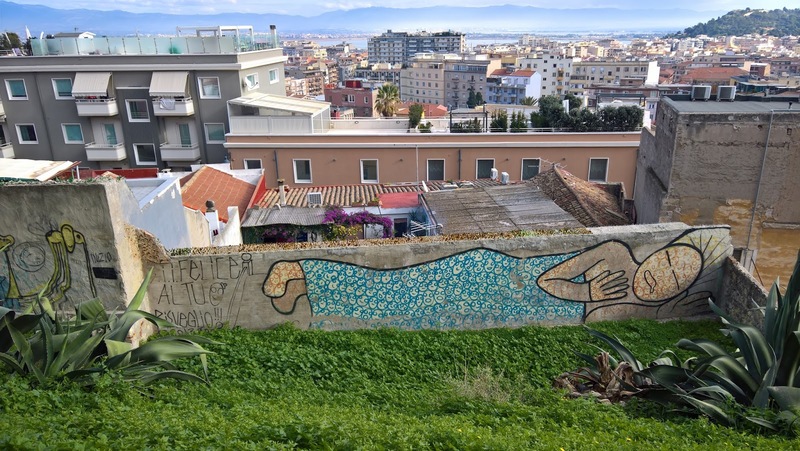 Located at the south end of the island, Cagliari has a population of about 150,000 and the Cagliaria metropolitan area is about 430,000. 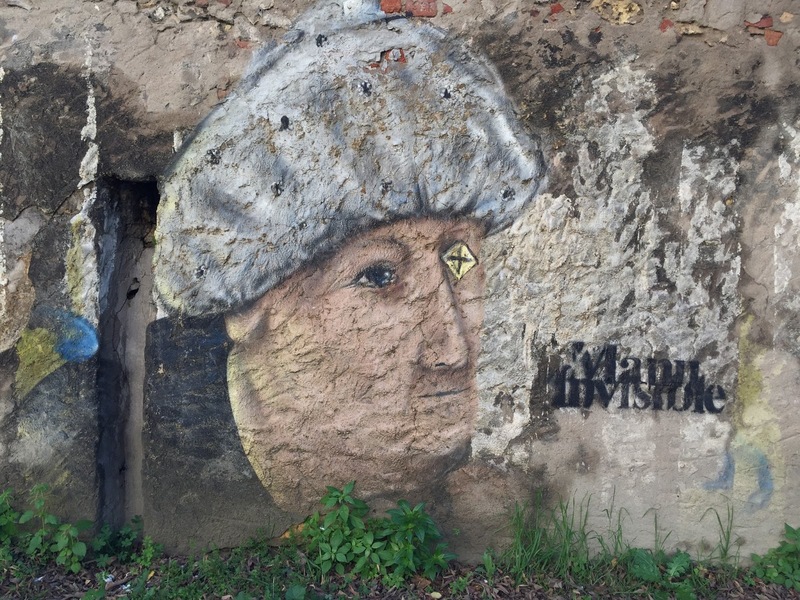 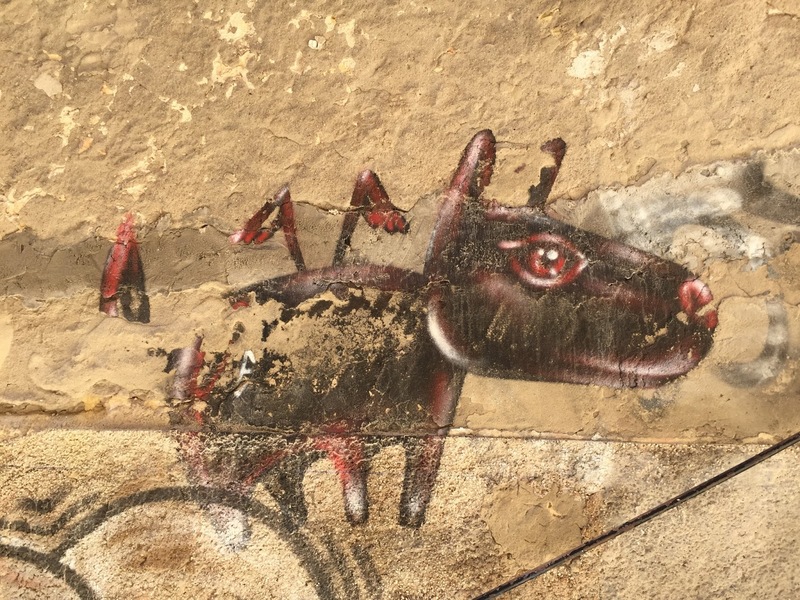 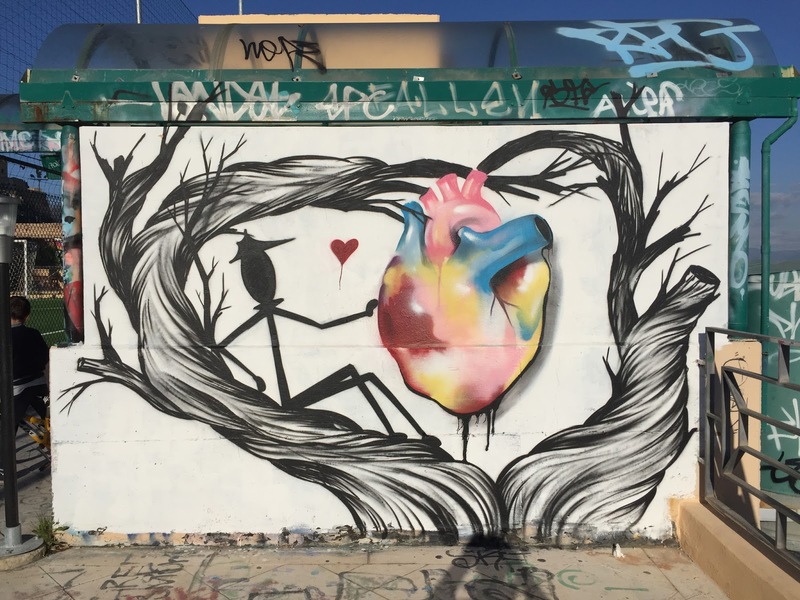 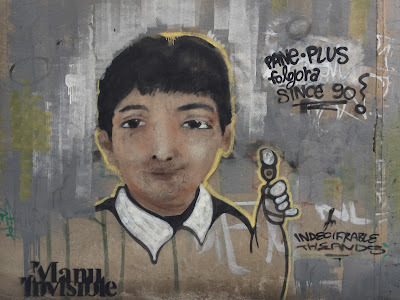 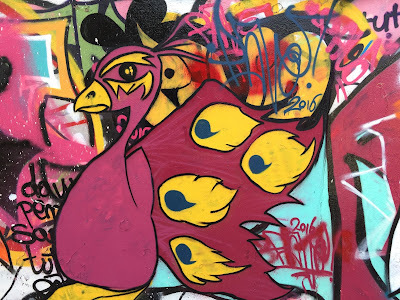 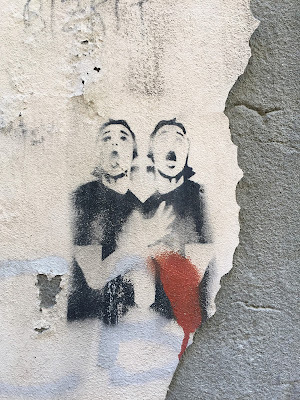 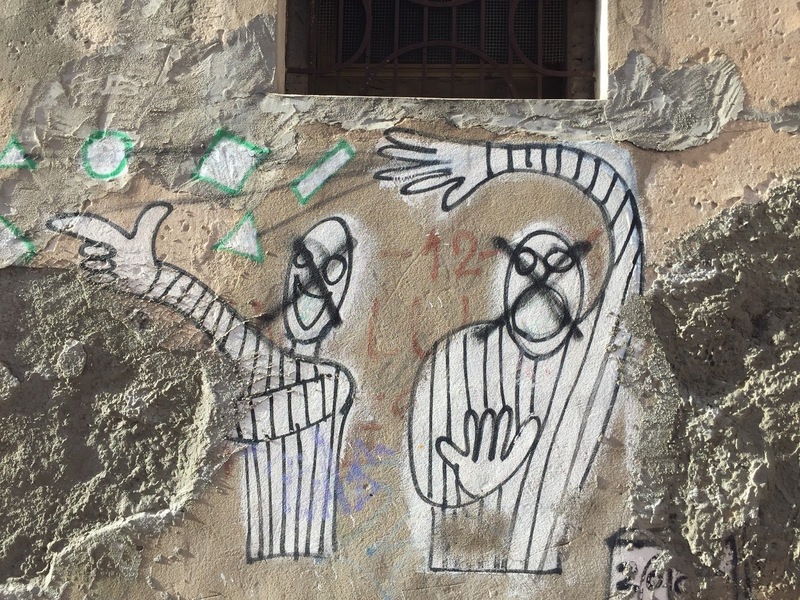 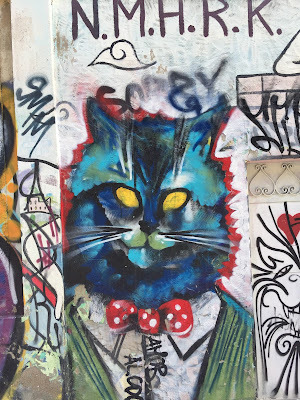 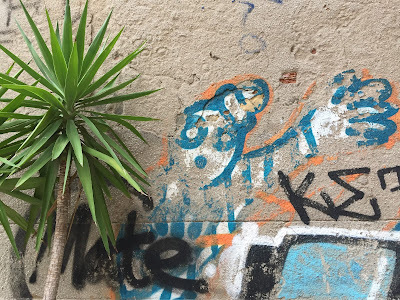 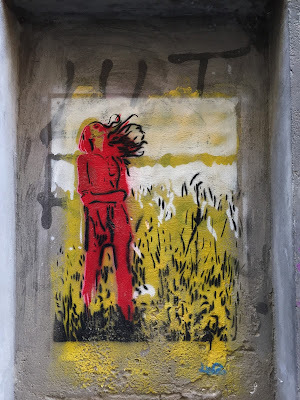 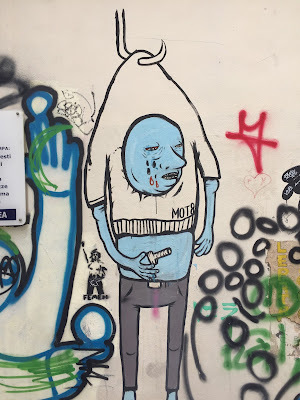 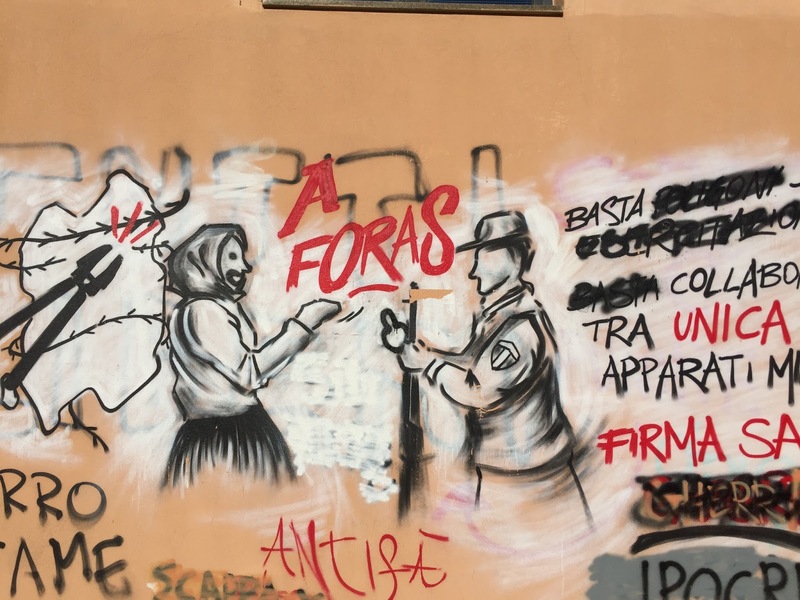 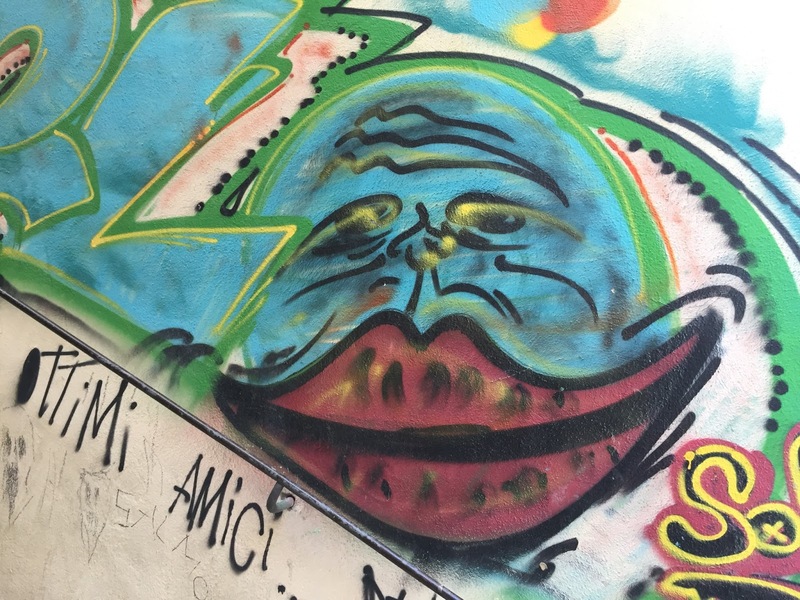 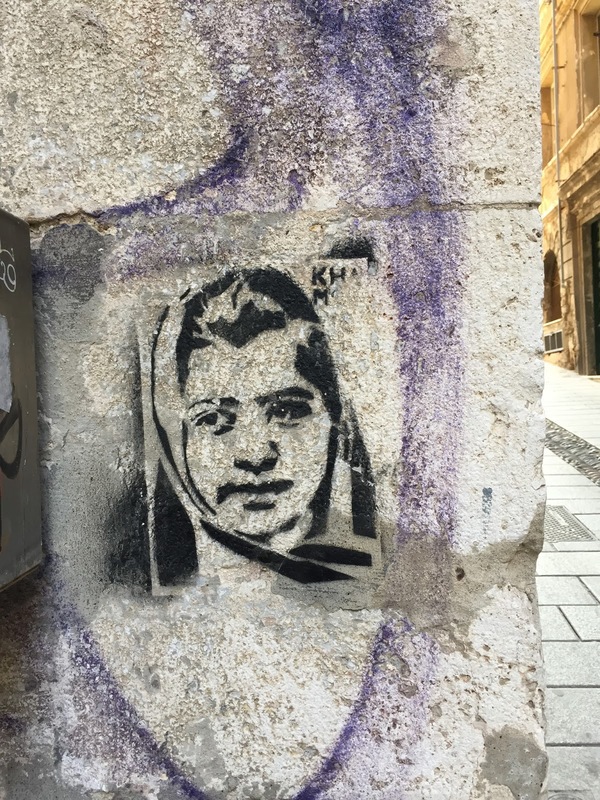 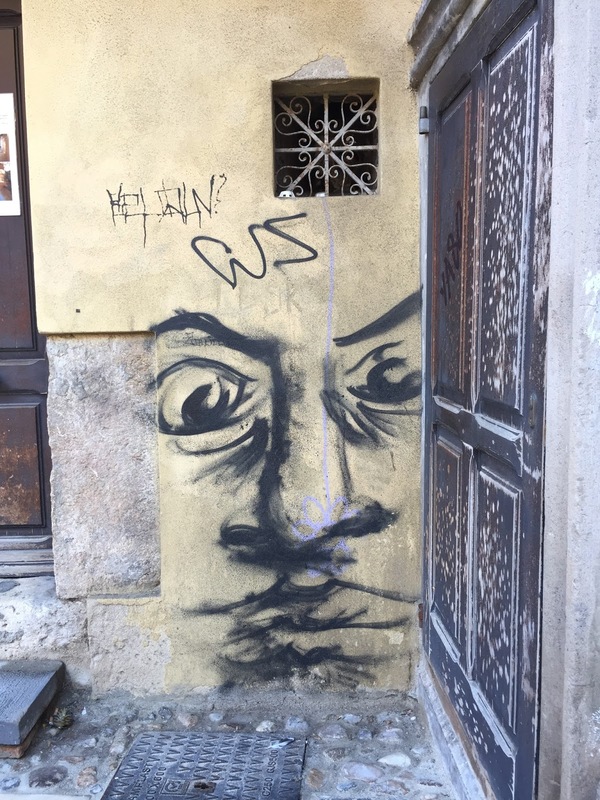 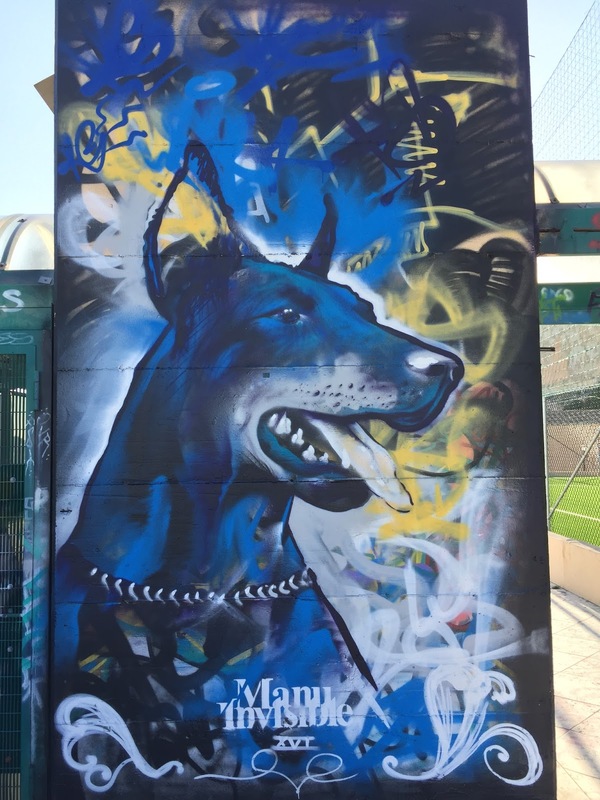 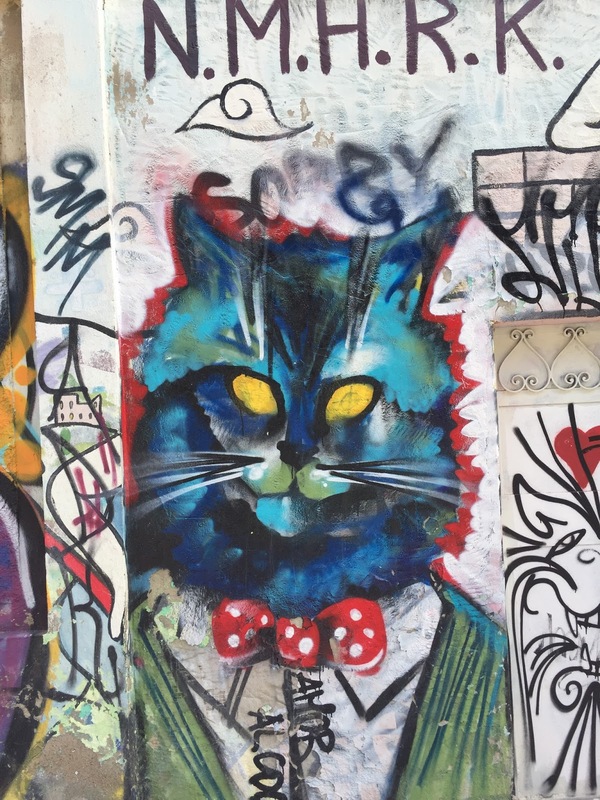 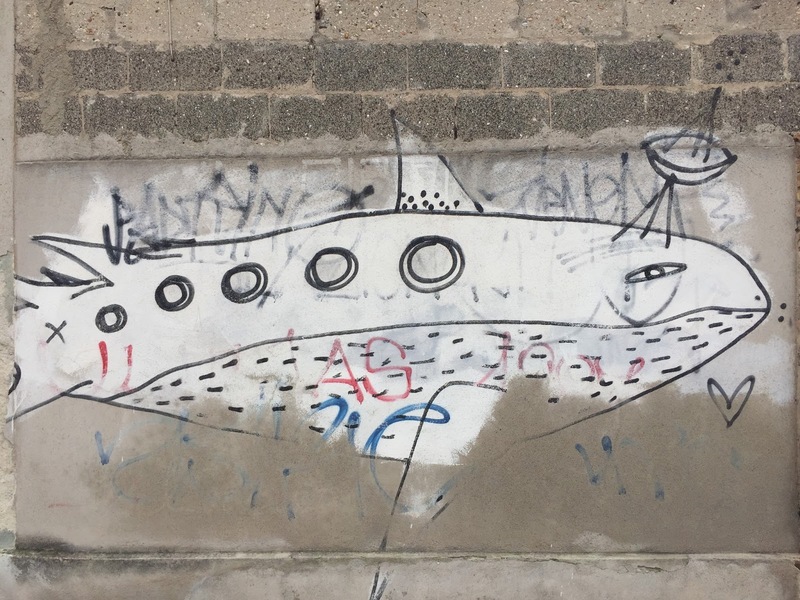 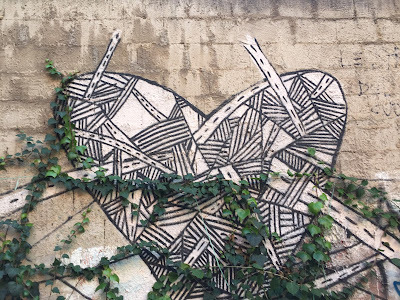 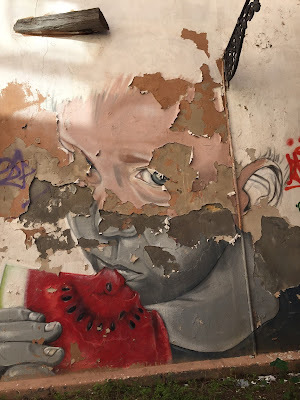 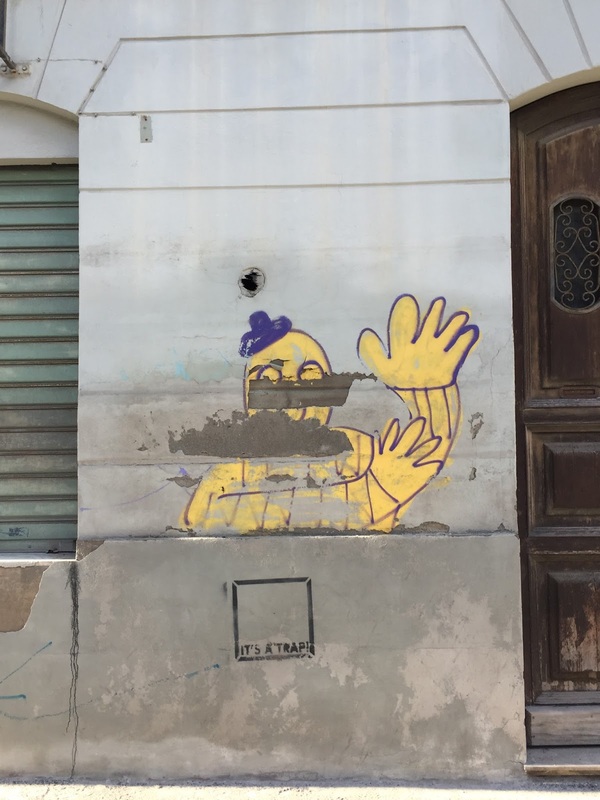 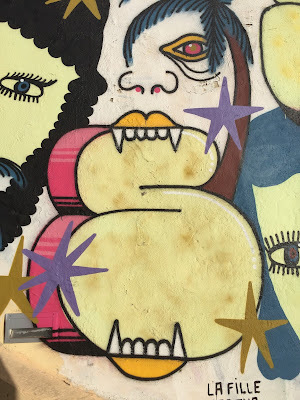 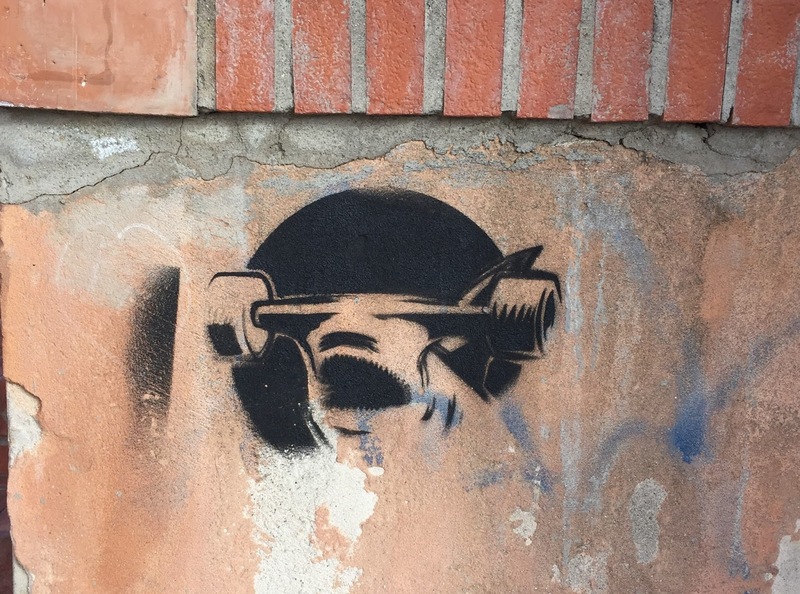 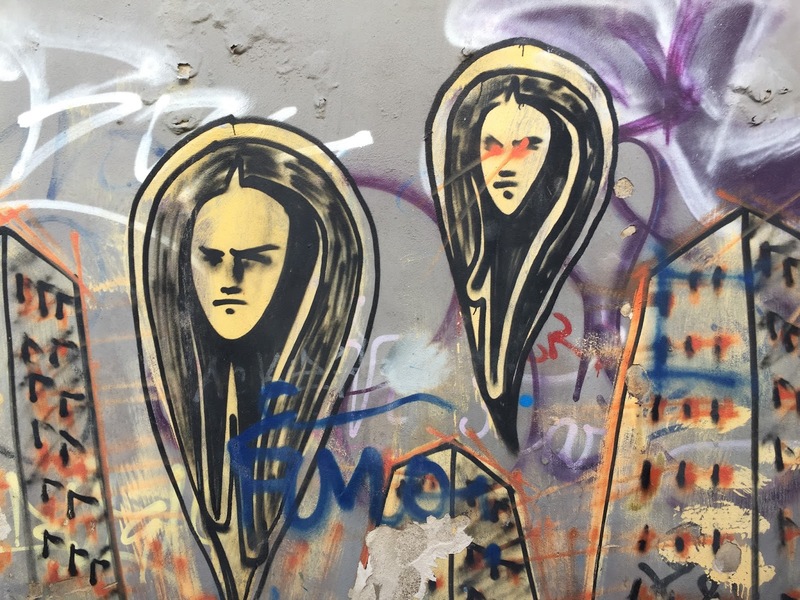 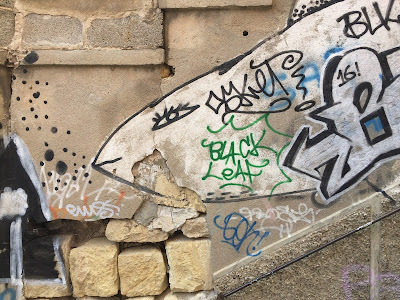 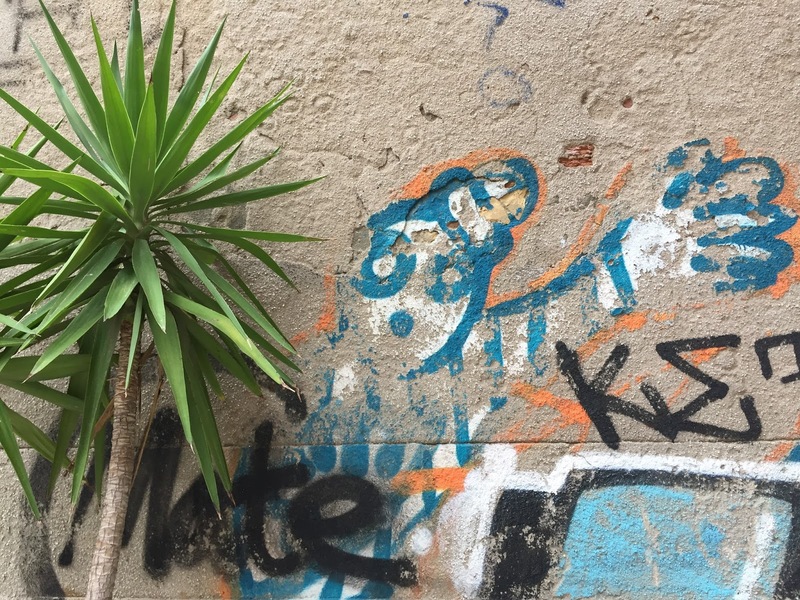 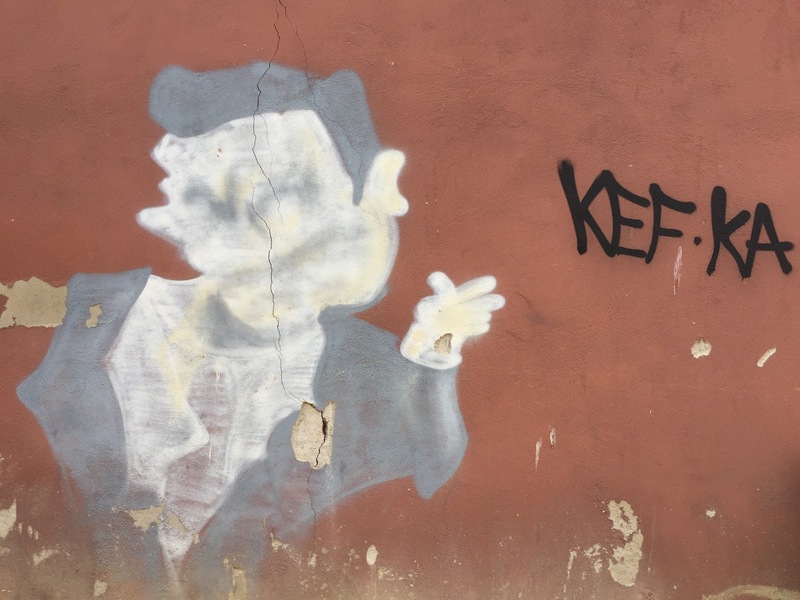 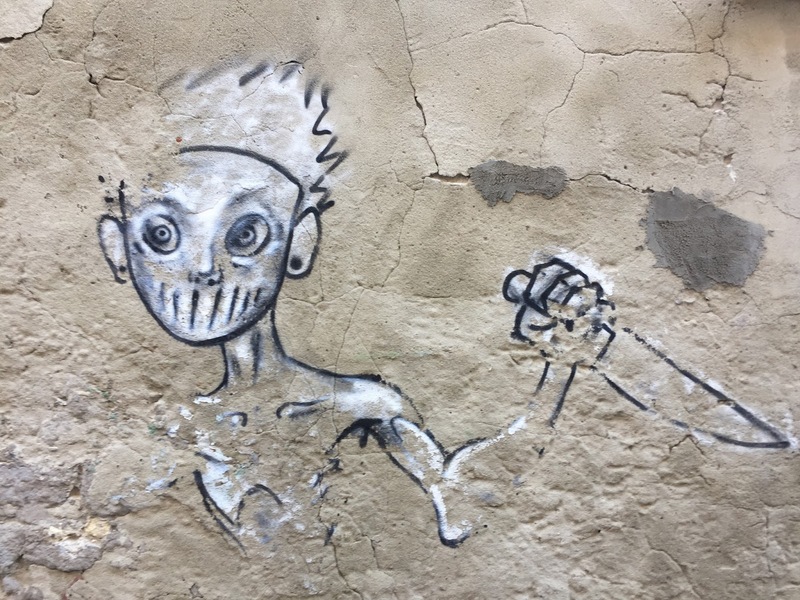 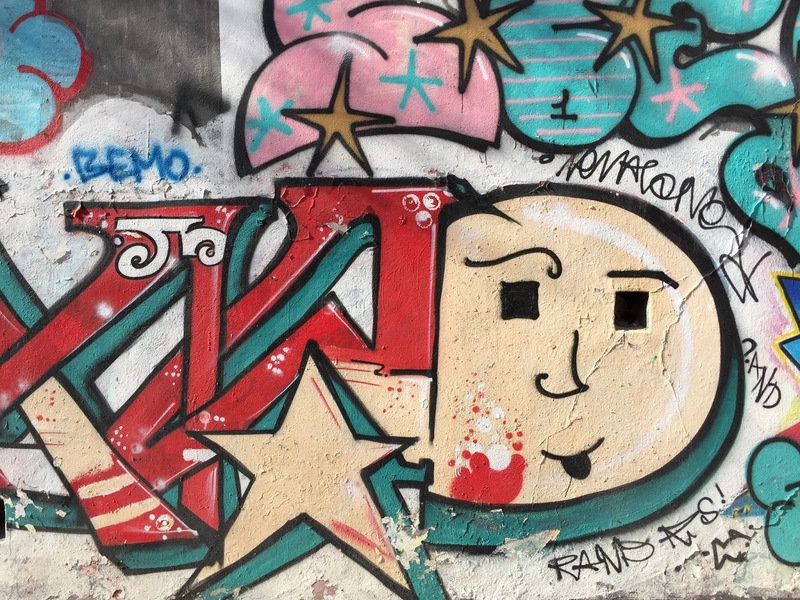 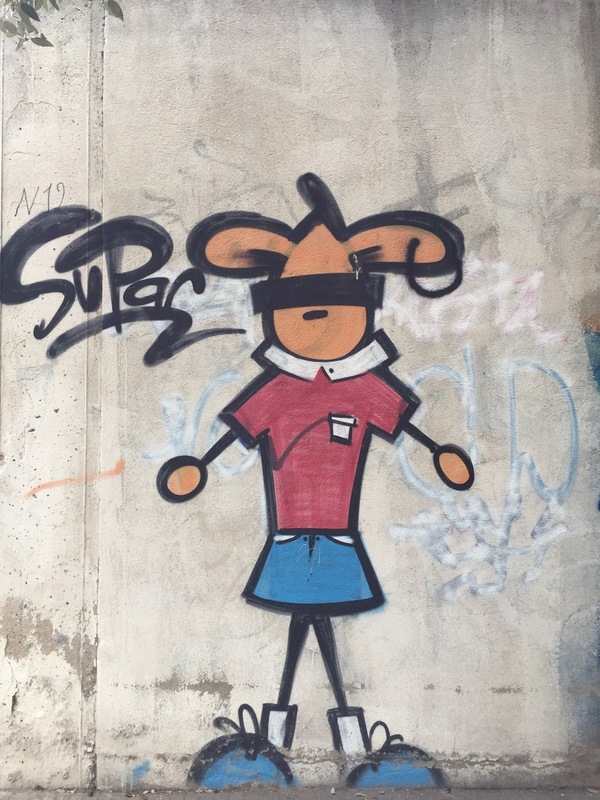 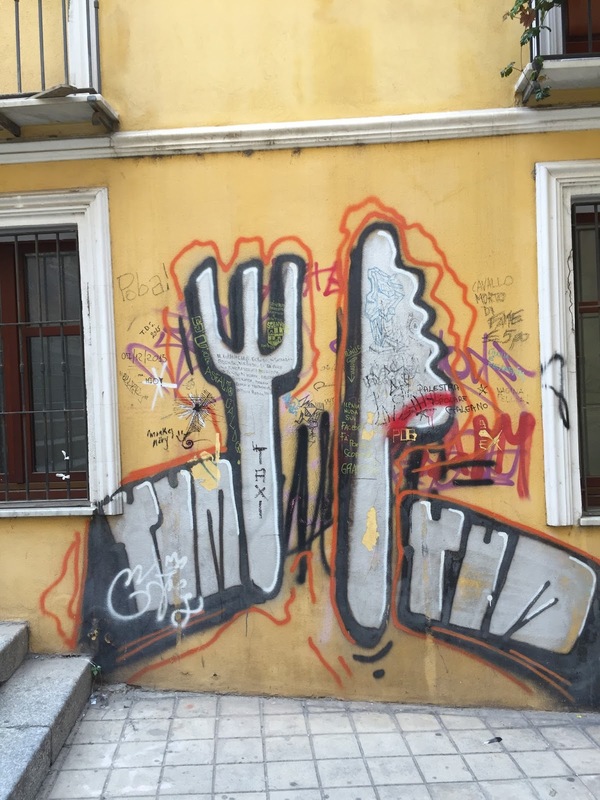 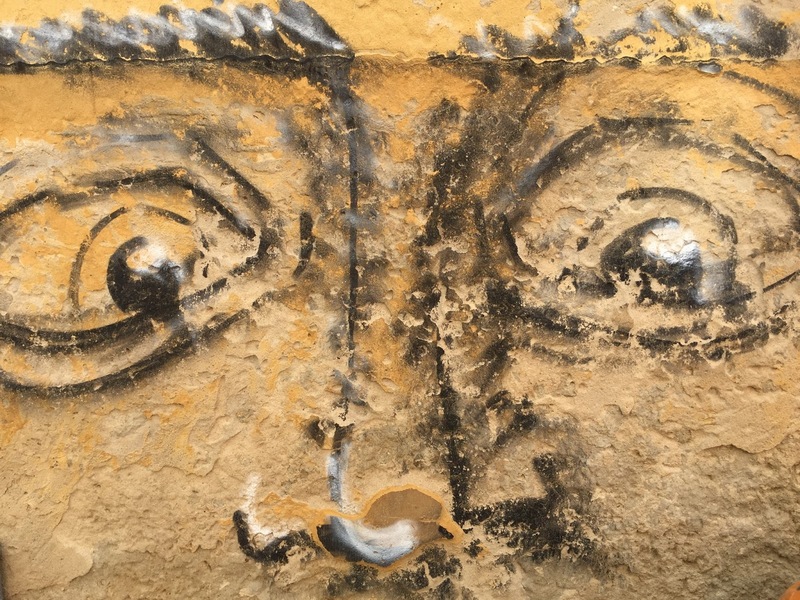 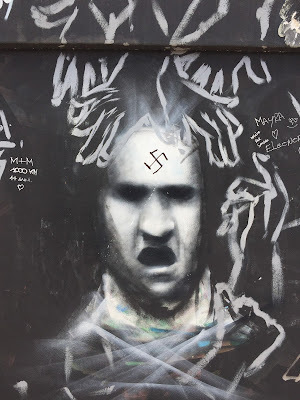 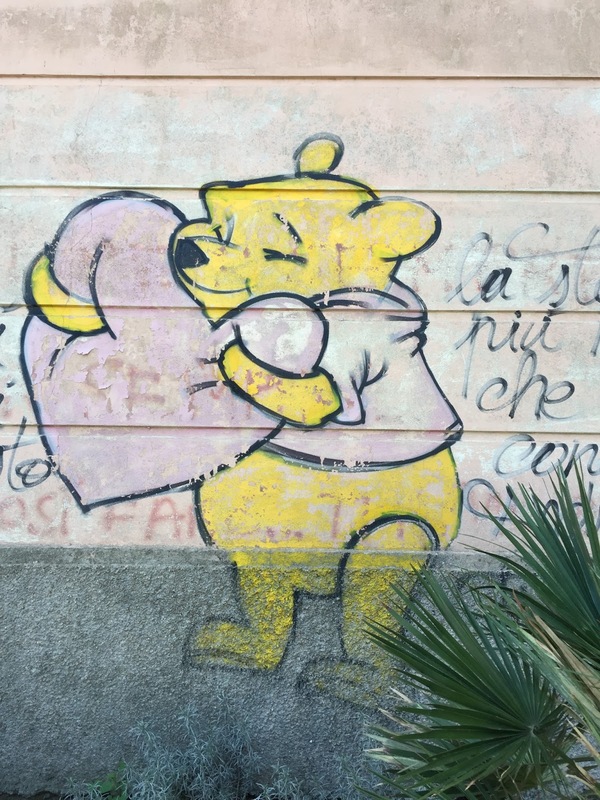 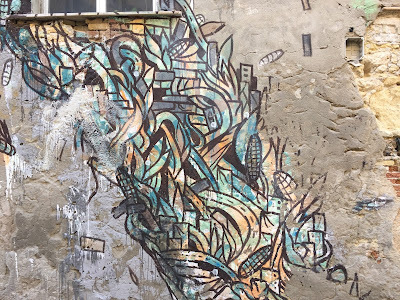 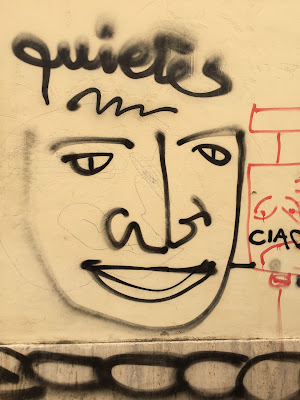 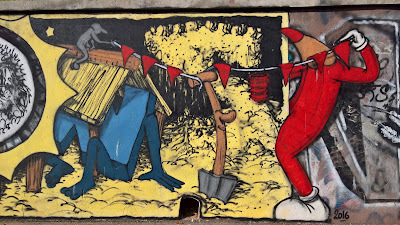 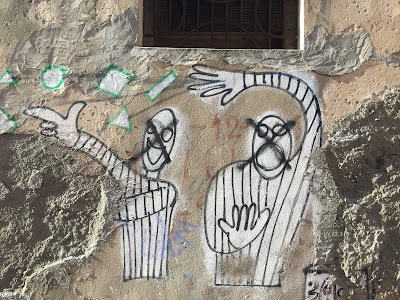 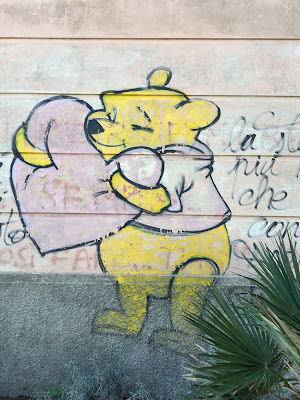 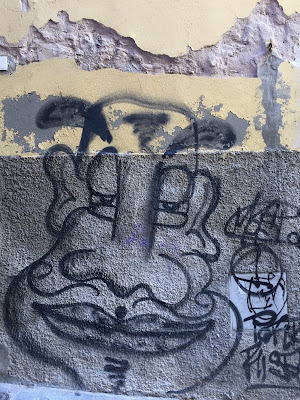 A couple of observations about the street art in Cagliari are in order. 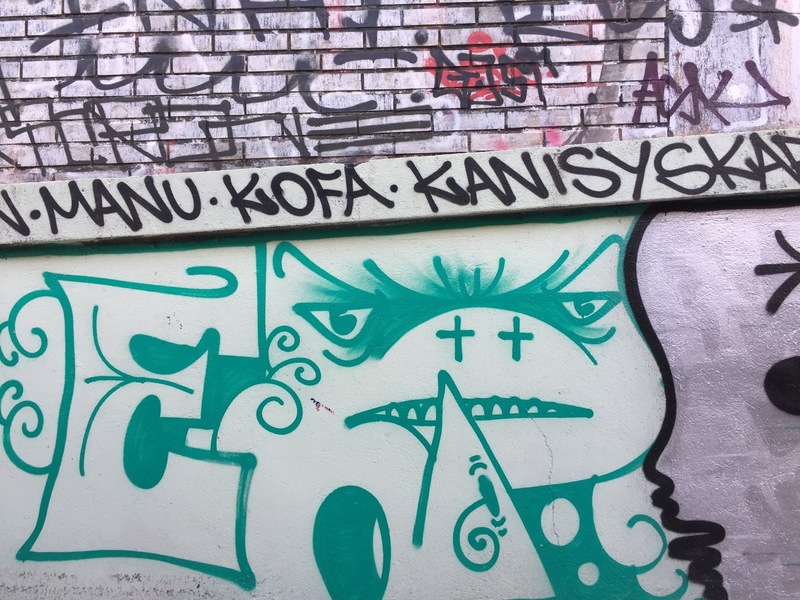 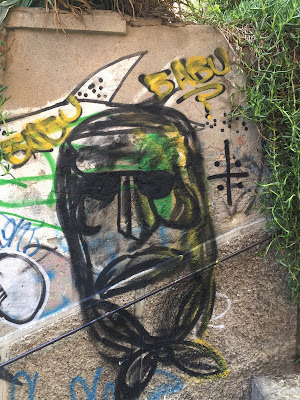 First, there was less “street art” and more “graffiti” (tags and random scribbling) then we expected. What street art there was, it wasn’t of a quality I would say knocks your socks off considering what we've seen in other cities (see the Travelmarx Pinterest board.) 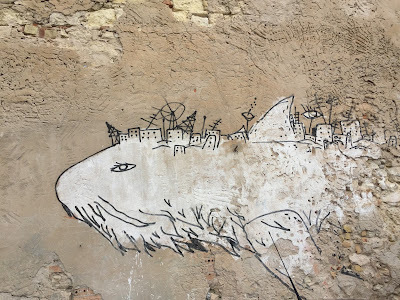 We say that knowing that we saw only a small fraction of what was there. 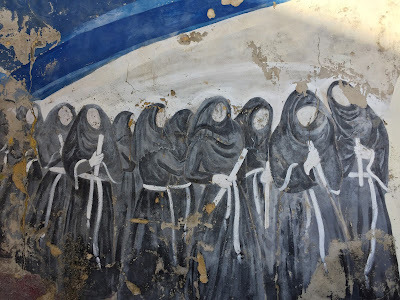 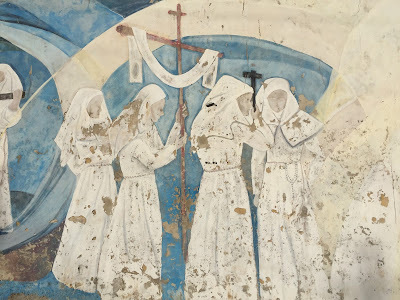 Also, there is a rich history of murals in Sardinia, but we are not talking about that here. 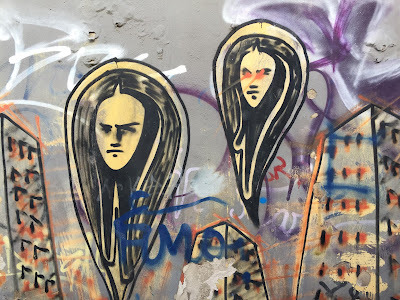 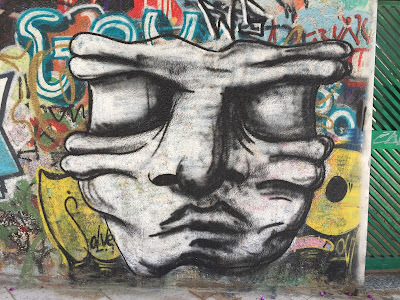 Finally, the street art we saw was predominantly positive in nature and usually dealing with faces or figures. 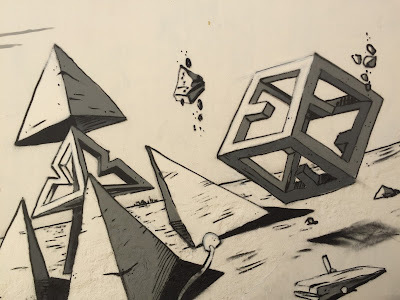 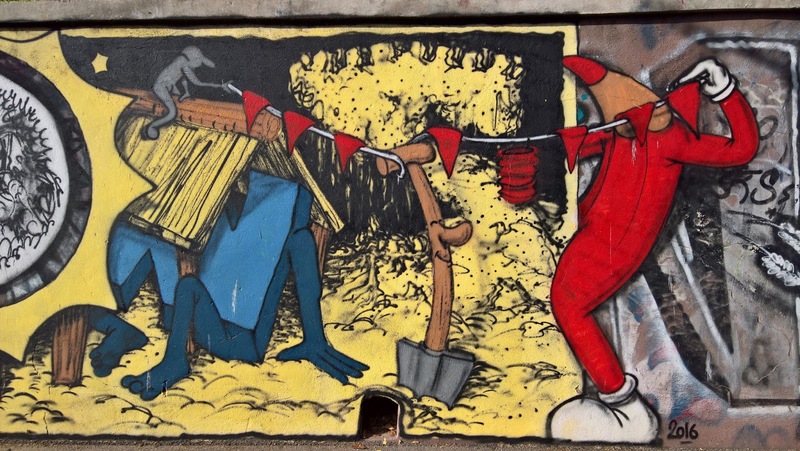 Criticism aside, we really liked the work of ManuInvisible.com whose work was present in both Cagliari and outside Cagliari, typically underpasses on highways. 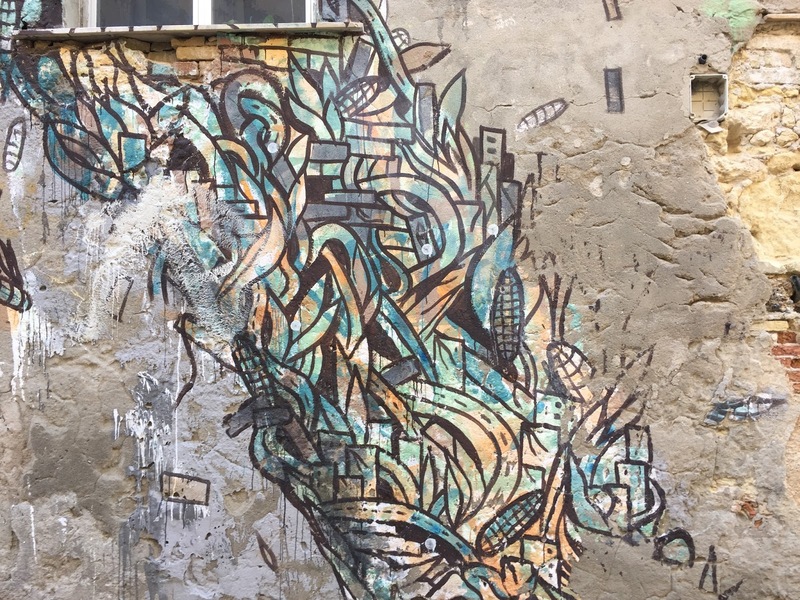 His work has a sense of style that rises above the rest. 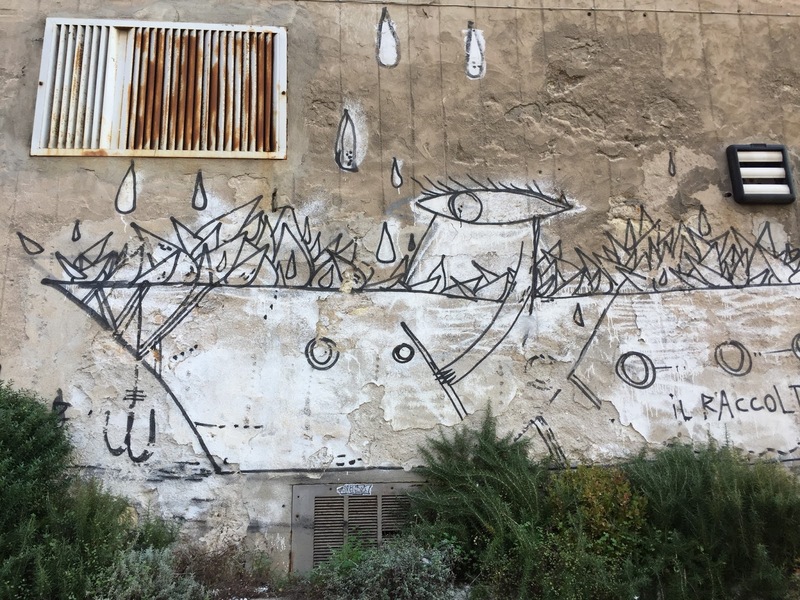 It would be worth searching out just his pieces if you are in the area. 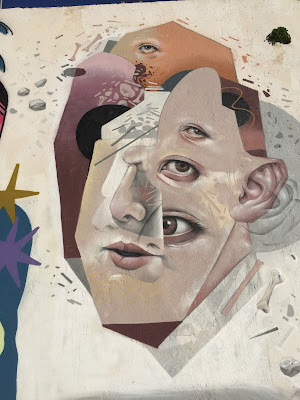 Also interesting is the work of CRISA (Federico Carta) and the pieces signed s.i.i. 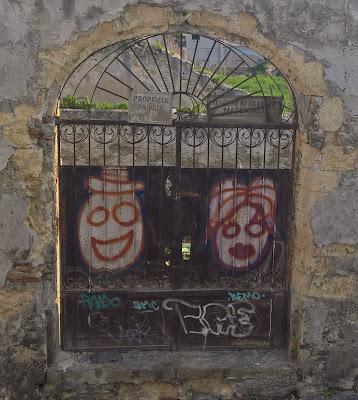 felice with their ghost-clown faces, which are strangely affective. All three of these artists are shown in the photos below. 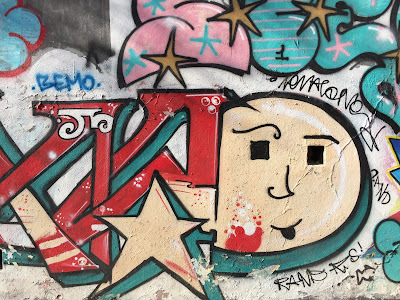 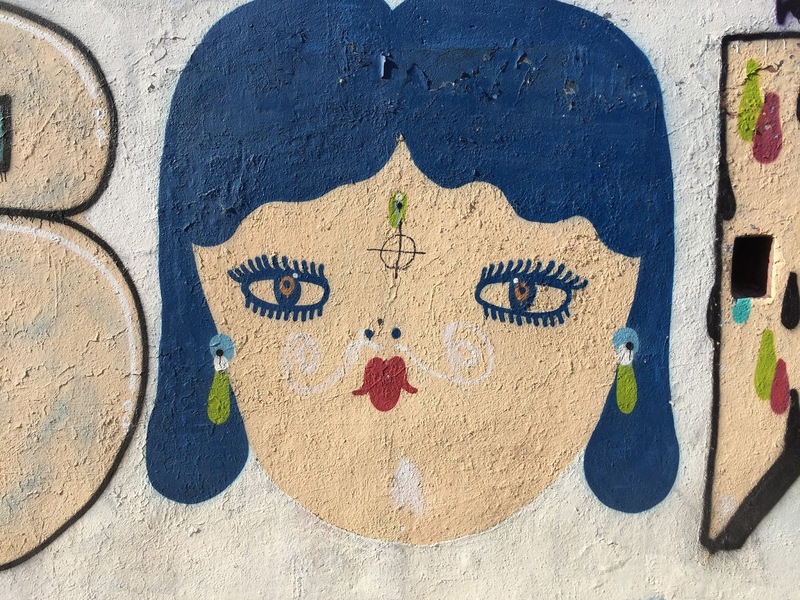 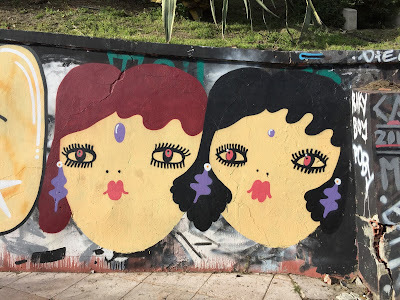 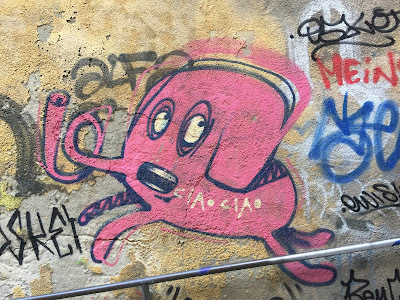 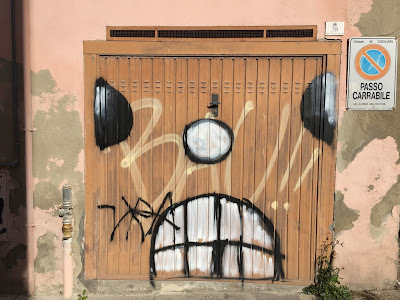 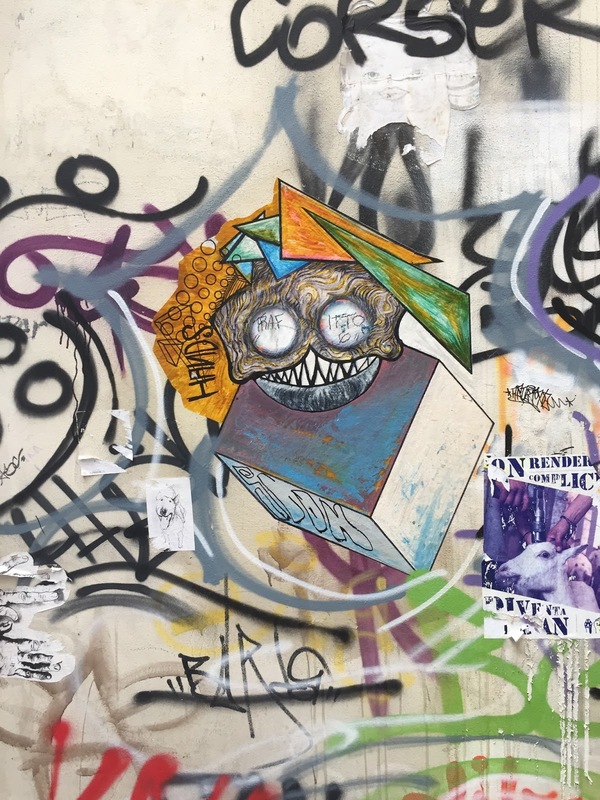 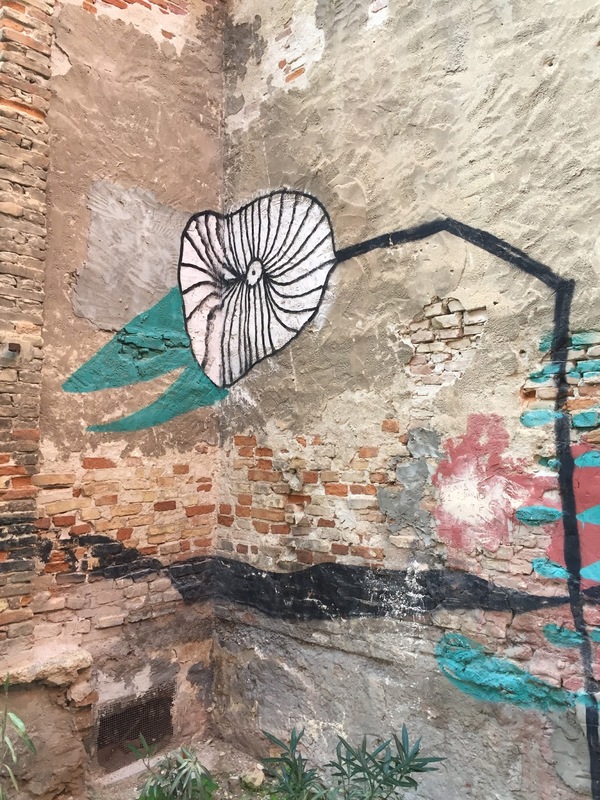 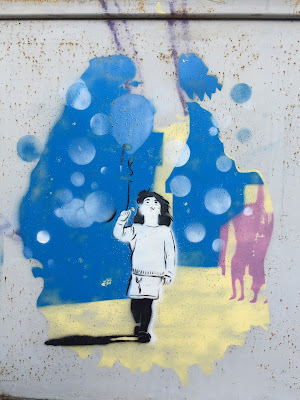 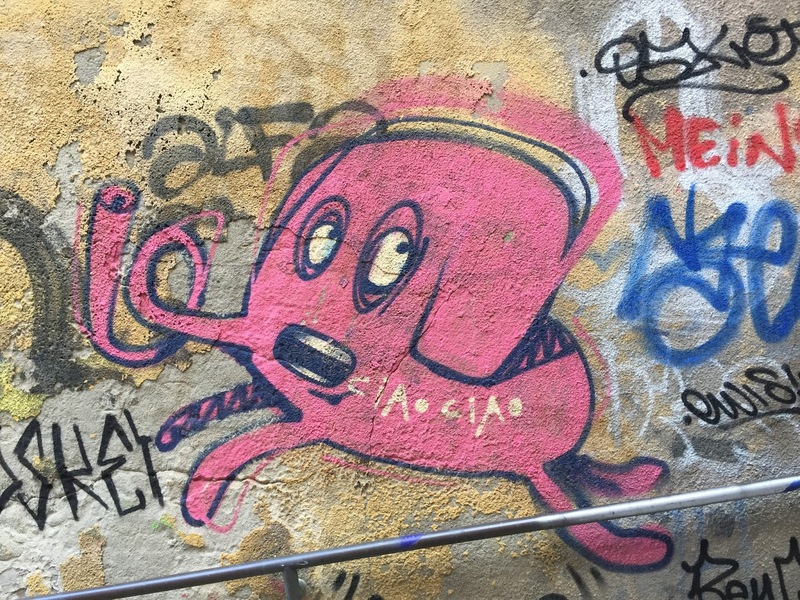 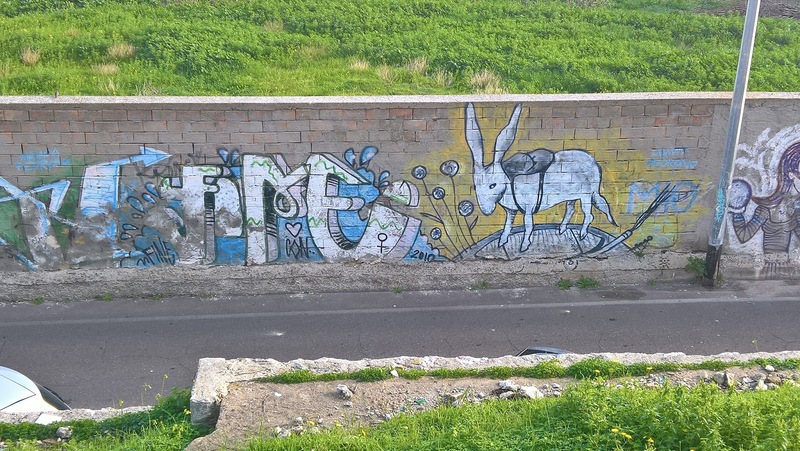 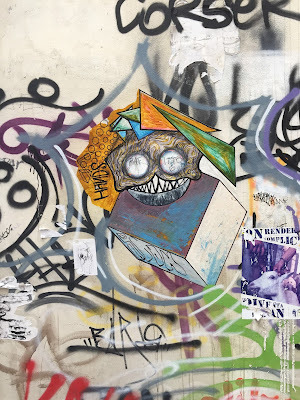 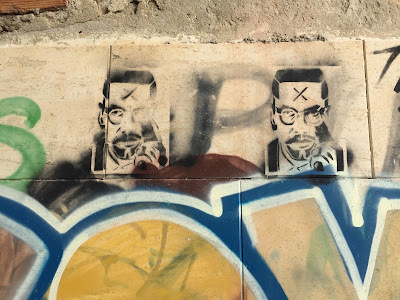 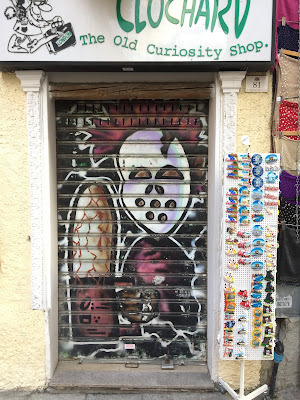 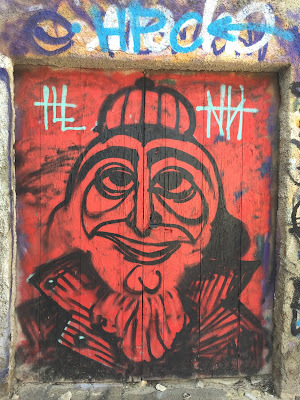 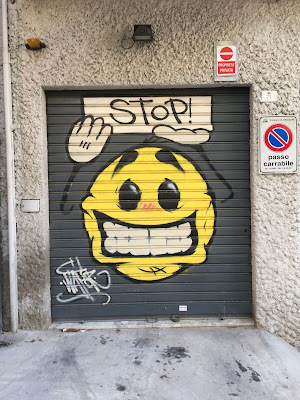 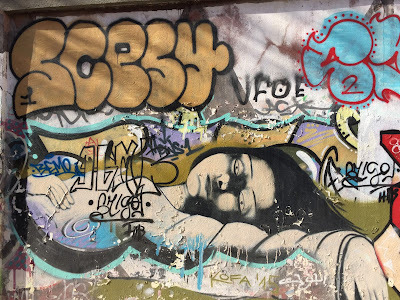 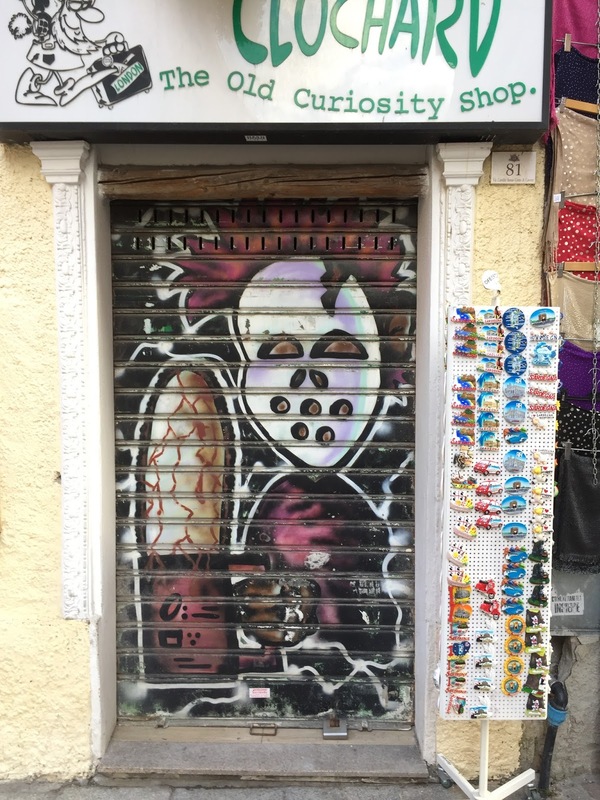 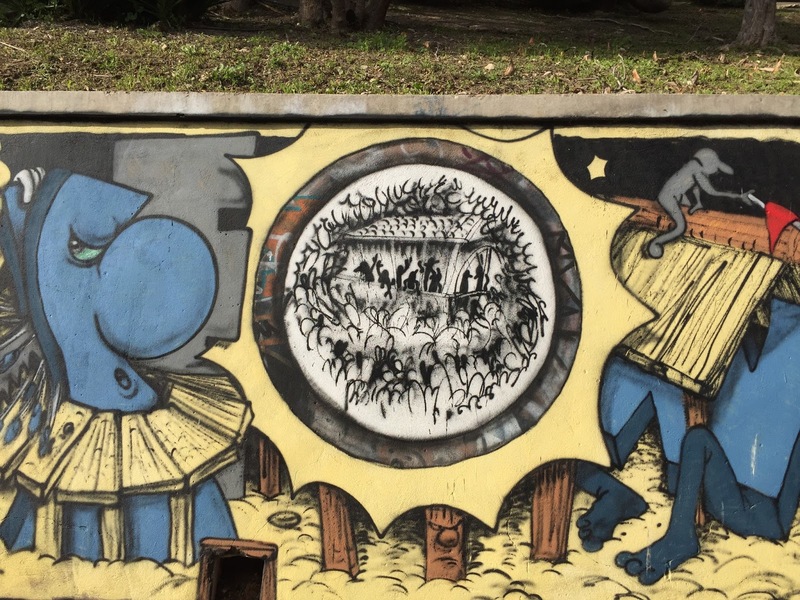 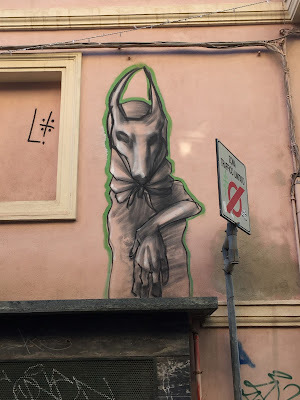 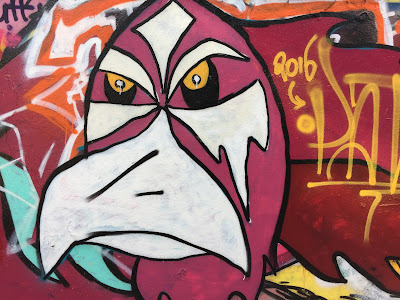 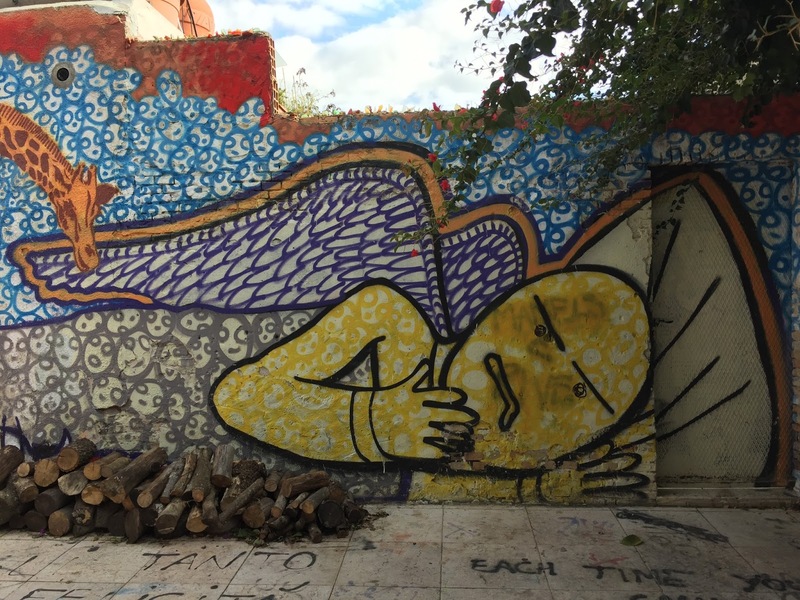 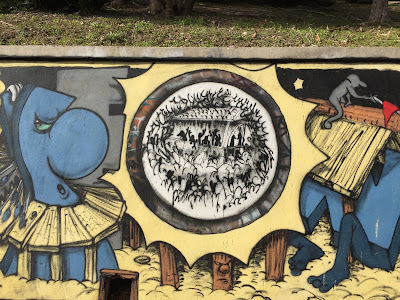 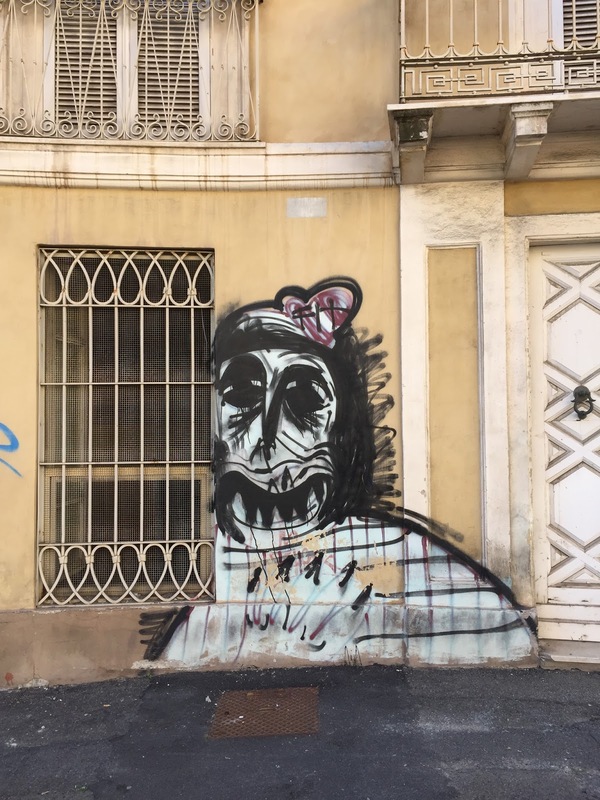 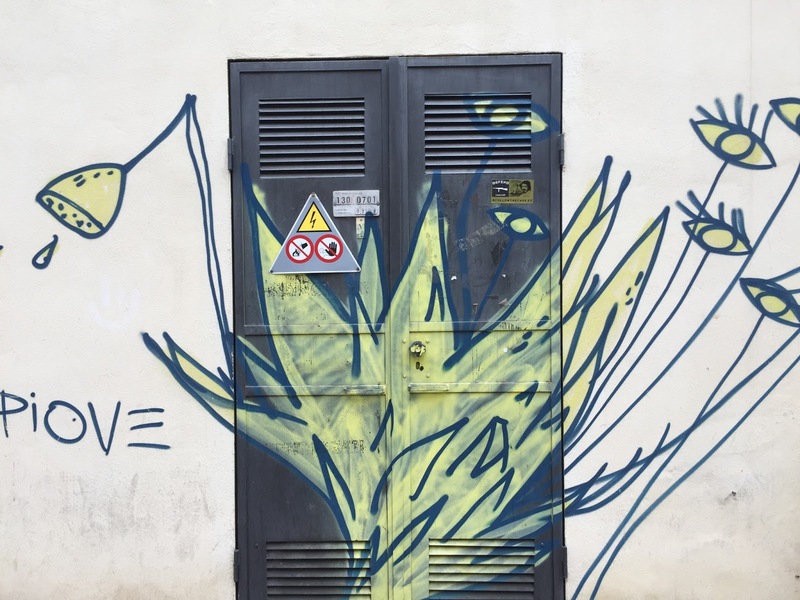 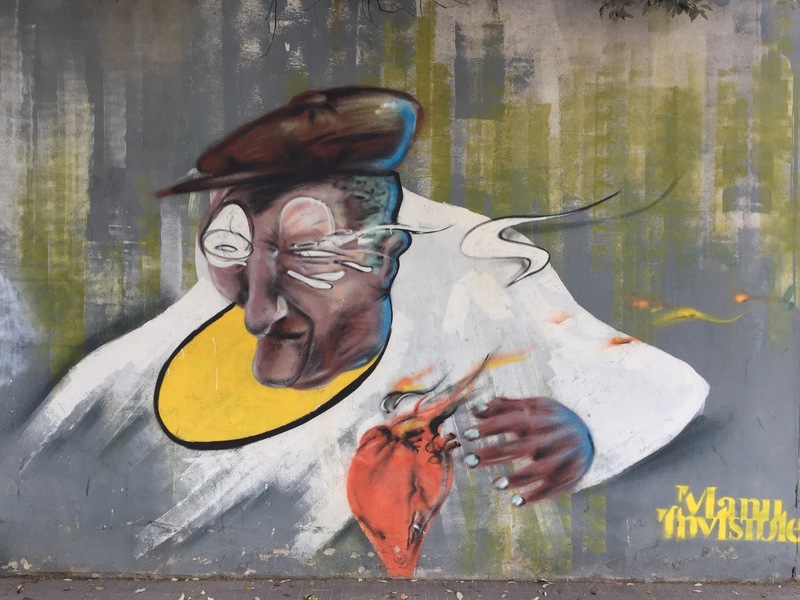 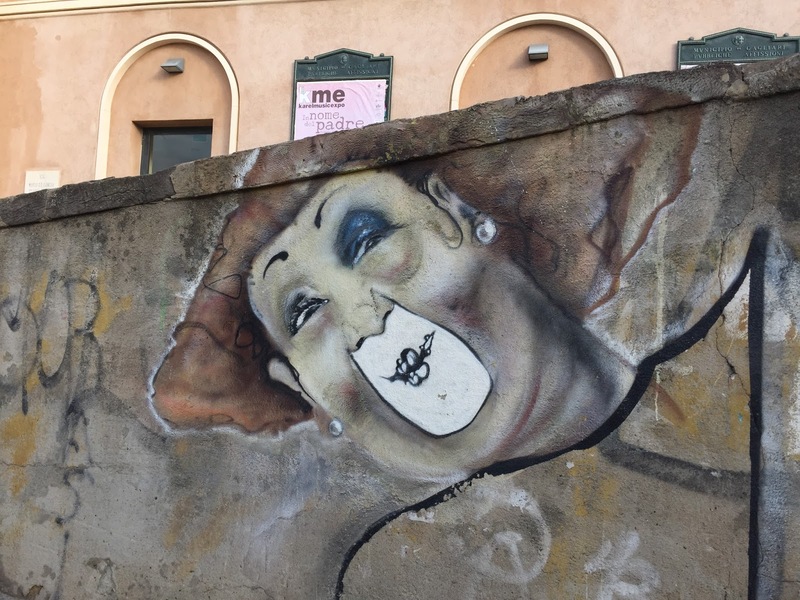 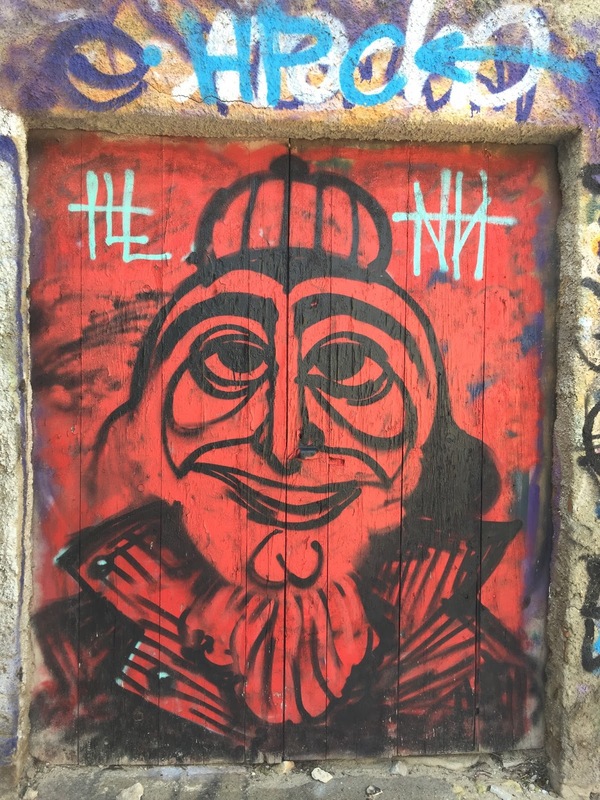 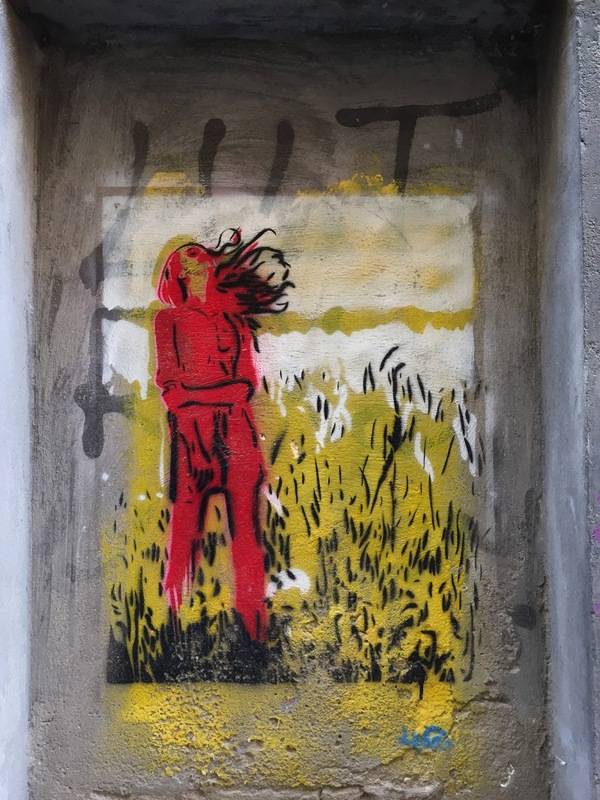 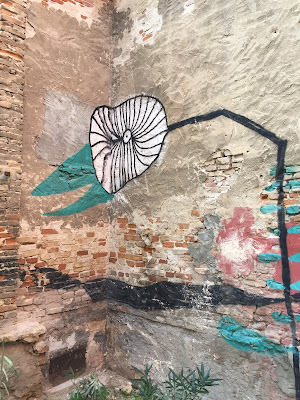 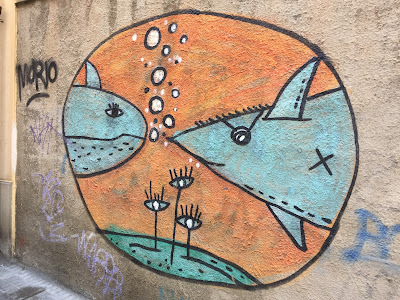 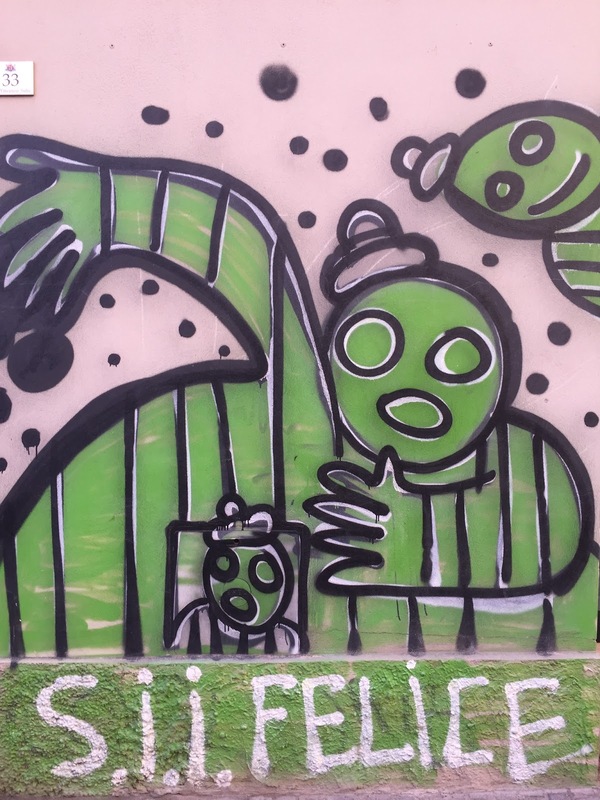 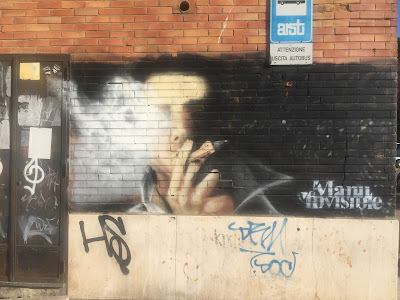 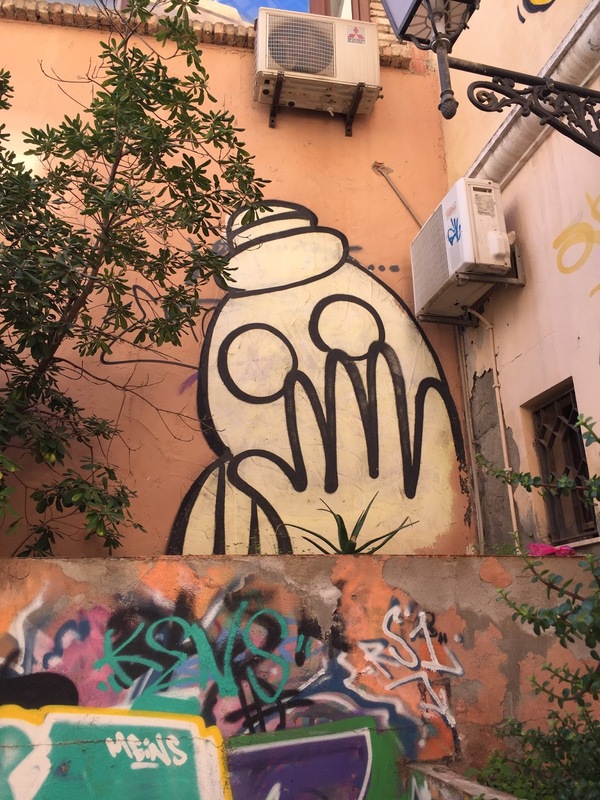 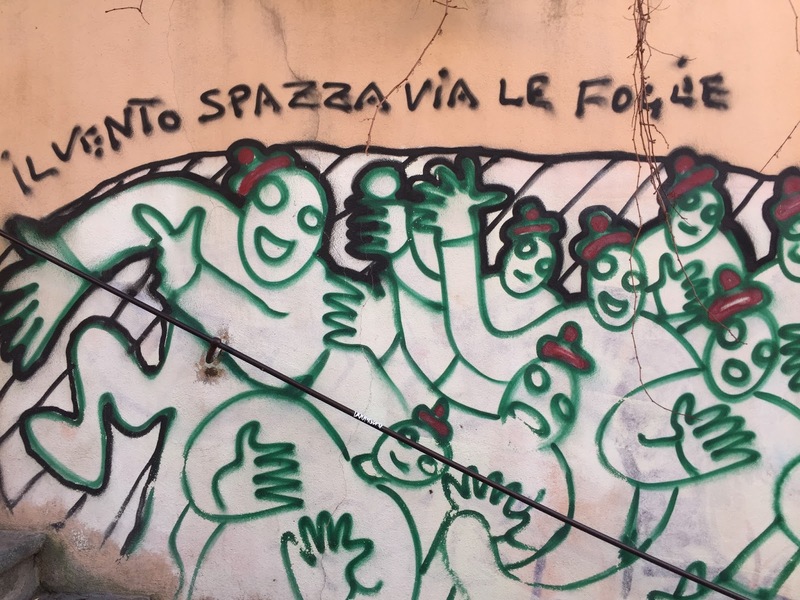 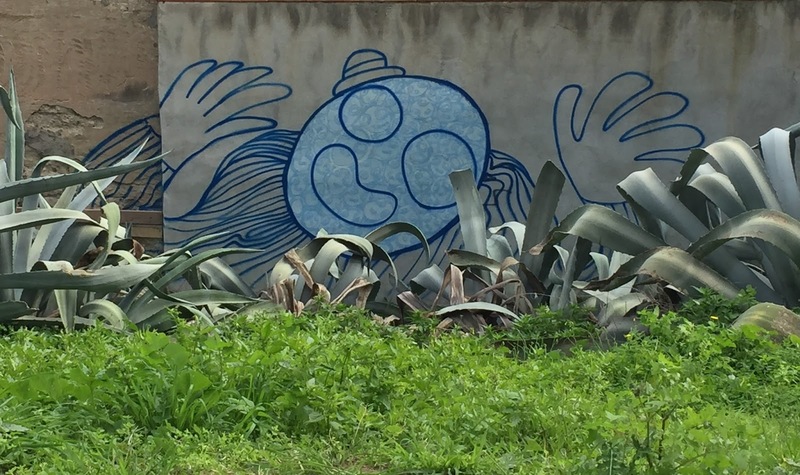 Finally, in Cagliari, Via S. Saturnino, which runs east and parallel of Viale Regina Elina, seems to be a spot to catch a good sampling of street art. 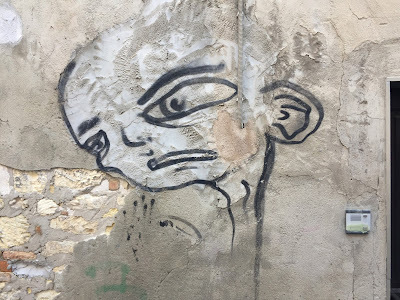 Other that that, head out on foot and start exploring! 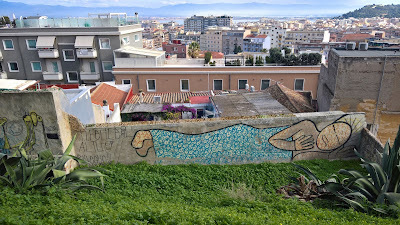 ManuInvisibile pieces around Cagliari. 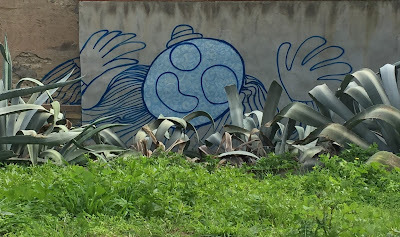 Left: Anziano con berritta (2010). 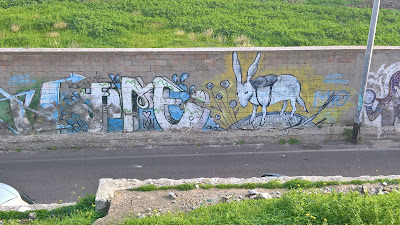 Right: Pagliaccio Donna (2010). 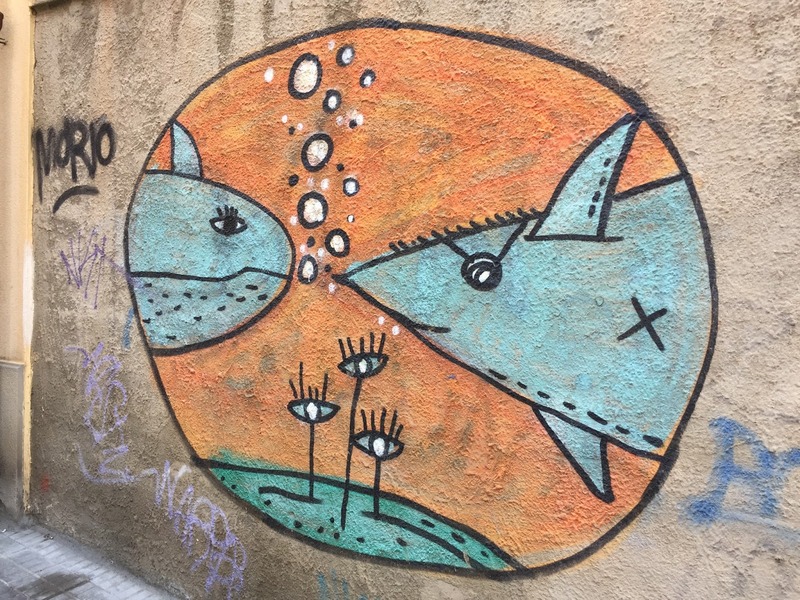 CRISA and similar: fish, hearts, boat, plants. Horizontal images, possibly all s.i.i. 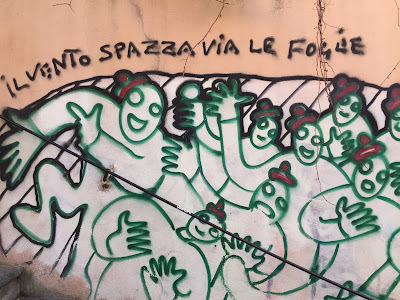 felice. Wall images across from the Chiesa di San Giacomo, Cagliari Sardinia. s.i.i. 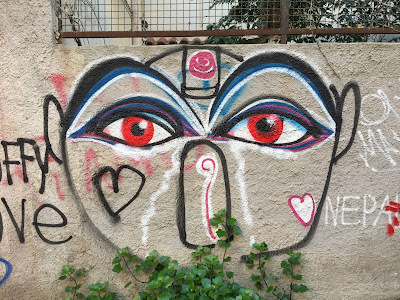 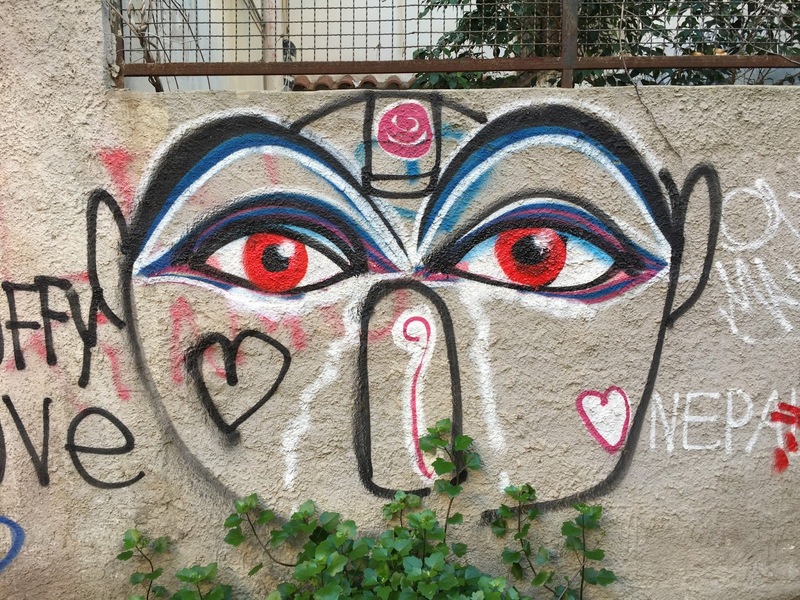 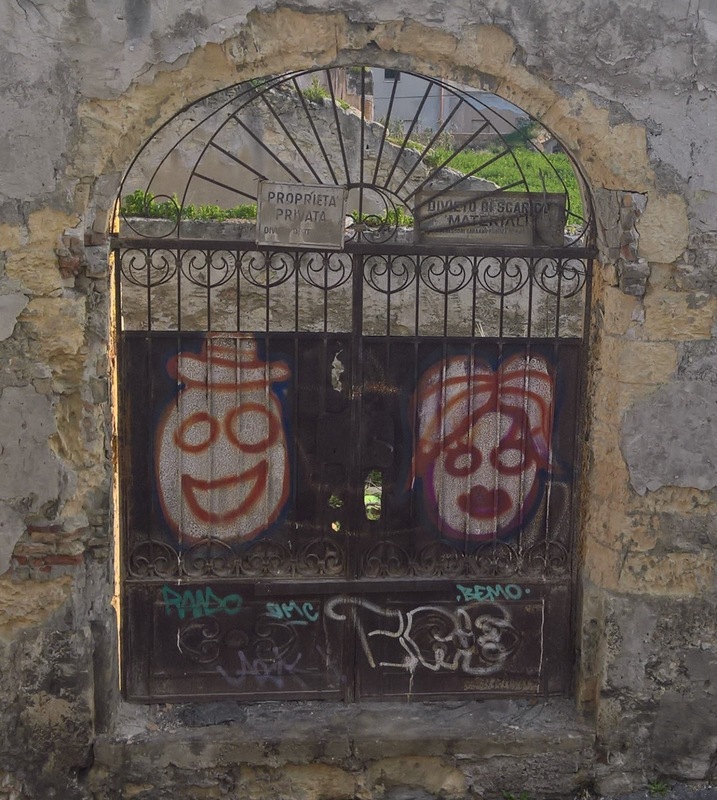 felice in Cagliari: round-eyed clowns. 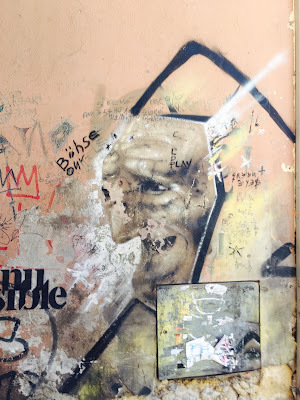 Wall stencils in Cagliari Sardinia.